The differential transmits power from the engine to a pair of driving wheels, dividing the force equally between them but permitting the wheels to follow paths of different lengths, as when turning a corner or traversing an uneven road. Most people don't realize that in a turn, the wheels must turn at different speeds. The inside wheel might revolve once while the outside wheel revolves several times around the corner because it has farther to go. If the differential didn't do that, the rear tires would wear out rapidly and develop flat spots while the uneven power would cause a loss of control. 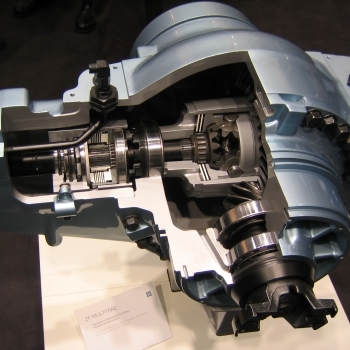 The differential gear is actually, an amazing invention that makes today's vehicles controllable in uneven circumstances. How often does the differential fluid need to be changed? Most manufacturers recommend that the differential fluid be changed every 30,000 to 60,000 miles. How much does it cost to fix a differential? Of course, it depends on what needs repairing. Rear Wheel Drive vehicles have one differential and 4 wheel drive vehicles have a front differential and a rear differential. The cost depends on the repair. Common repairs are: replace oil seal, adjust backlash, or rebuild. Both Diagnostics and Estimates are FREE. Make an appointment to bring the vehicle in for a diagnostic and and get an estimate. How do I know if I need differential repair? Several situations can create ring-and-pinion noise. If the gears have been quiet and begin to howl, they are probably worn or wearing. If the gears howl during deceleration only, it's possible that the pinion-bearing preload has loosened. Howling under acceleration at all speeds indicates that something in the differential -- gears, pinion or carrier bearings -- has worn or no longer keeps the gear alignment correct. If the gears howl while accelerating over a certain speed range, but not all speeds, it's likely that the gears are worn due to lubrication failure or overloading. When a newly installed gear set howls, suspect the design or setup. Rumbling while turning, on the other hand, is most often a sign of bad wheel bearings not of a bad differential. Most differential problems build over time but if not repaired, can cause extensive internal damage. A leaking differential may just need seals or a gasket to avoid damaging the differential. Checking the oil level is important if you have a leak. Please fill out the following form so we can better assist you with your transmission needs & receive a FREE DIAGNOSIS. We will contact you by email to confirm an appointment day and time. Third, we will also do an under car check looking for any leaks or incorrect adjustments. When we are doing the under car evaluation we look for not only transmisison leaks/transfer case/cooler lines etc., we will also advise you if their is something else we see or do not do see. We also check the differentials and power steering fluids. When looking for improper adjustments we want to make sure that something simple is not the causing the problem. The Certi-Care Evaluation Shield represents our commitment to your safety and is performed at no cost for our valuable customers. To request an automotive repair or service complete the form below. Once submitted our Bellevue transmission shop will receive an email notification and will reply as quickly as possible - usually the same day. You can call us, mail us, or email us. Please fill out the following form to email us. If you provide us with your phone number, a professional transmission expert will be happy to call you.